Flavored coffee beans are coated with flavor compounds to supplement coffee beans' natural taste. In addition, these flavors help extend the shelf life of coffee by disguising changes in flavor due to decaffeination, oxidation, or aging processes. Flavored coffees in one form or another have been used for centuries, but the gourmet coffee boom of the 1990s resulted in an increased interest in exotic flavors of coffee. With current chemical technology, the beans can be produced with almost any flavor imaginable. The origins of coffee, like those of so many other natural products long known to humans, are shrouded in legends. One entertaining story about the discovery of coffee involves an ancient Ethiopian goatherder, Kaldi, and his dancing goats. One day, so the story goes, Kaldi noticed his normally sluggish goats were dancing on their hind legs and bleating gleefully. The observant goatherder also noted they had been feeding on the red berries of a nearby shiny dark-green shrub. Tossing caution to the wind, he sampled the berries himself and experienced an immediate boost in his spirits and energies. Kaldi offered some of the berries to the head monk of the local monastery, who conducted a series of experiments on them, including parching them, crushing them in a mortar and pestle, and stirring the crushed berries in boiling water. The monk's efforts resulted in a fragrant beverage which he termed "heaven-sent," and henceforth gave it to all the monks in the evening to keep them from falling asleep during their prayers. News of this elixir quickly spread from the monastery to the nearby town and eventually throughout the world. The "magic" berries were actually coffee beans, and the heaven-sent beverage, of course, was coffee. Today coffee is harvested in nearly every tropical country within 1,000 miles (1,600 km) of the equator. Although many people regard flavored coffee as a modern invention, its origins are nearly as old as the original beverage itself. History shows that a few hundred years ago in the Middle East, people enjoyed drinking coffee blended with nuts and spices. In modern times, innovative marketers have capitalized on coffee drinkers' desire for more flavors than nature can provide and have found new ways to introduce flavoring agents into coffee. First, flavored syrups were used to spike brewed coffee with a touch of a favored flavor. More recent improvements in food science have led to ways of introducing complex flavors directly onto the beans as part of a post-roasting process. When these flavored beans are used for brewing, the flavor is extracted into the resulting beverage. Today consumers can choose from a wide array of flavored coffee beans with names like "Chocolate Swiss Almond," "Hazelnut," "Amaretto Supreme," "Irish Creme," "French Vanilla," and "Georgia Pecan." The type of bean used to make flavored coffee greatly impacts the taste of the finished product. It is estimated that coffee beans contain over 800 different compounds which contribute to their flavor, including sugars and other carbohydrates, mineral salts, organic acids, aromatic oils, and methylxanthines, a chemical class which includes caffeine. The bean's flavor is a function of where it was grown and how it was roasted. The name of the beans usually indicate their country of origin, along with additional information, such as the region within the country where the beans were grown, the grade of beans, or the type of roast. For instance, "Sumatra Lintong" denotes a specific growing region (Lintong) in Sumatra; "Kenya AA" designates AA beans, the highest grade of beans from Kenya; and "French Roast" is a blend of beans which are roasted very dark in the "French style." Some flavored coffees consist of only one kind of bean, like Kenya AA, which has distinctive regional taste characteristics. In general Coffea arabica (or arabica) beans are used for flavored coffees due to their low levels of acidity and bitterness. Arabica was the earliest cultivated species of coffee and is still the most highly prized. These top quality beans are milder and more flavorful than the harsher Coffea canefora (or robusta) beans, which are used in many commercial and instant coffees. Some manufacturers create flavored coffees from a blend of beans from various regions. High quality beans are grown in Colombia, Mexico, Costa Rica, and Guatemala. Flavoring oils are combinations of natural and synthetic flavor chemicals which are compounded by professional flavor chemists. Natural oils used in flavored coffees are extracted from a variety of sources, such as vanilla beans, cocoa beans, and various nuts and berries. Cinnamon, clove, and chicory are also used in a variety of coffee flavors. Synthetic flavor agents are chemicals which are manufactured on a commercial basis. For example, a nutty, woody, musty flavor can be produced with 2, 4-Dimethyl-5-acetylthiazole. Similarly, 2,5-Dimethylpyrazine is used to add an earthy, almost peanuty or potato-like flavor. Flavor chemists blend many such oils to achieve specific flavor combinations. While other food flavors may be composed of nine or 10 ingredients, coffee flavors may require up to 80 different compounds to achieve subtle flavors. Virtually any taste can be reproduced. Marketers have found that consumers prefer coffee flavors with sweet creamy notes. The ideal flavor should mask some of the harsh notes of the coffee yet not interfere with its aromatic characteristics. The pure flavor compounds described above are highly concentrated and must be diluted in a solvent to allow the blending of multiple oils and easy application to the beans. Common solvents include water, alcohol, propylene glycol, and fractionated vegetable oils. These solvents are generally volatile chemicals that are removed from the beans by drying. Older solvent system technology produced beans which dried up and lost flavor. Current technology uses more stable solvents which leave the beans with a glossy sheen and longer lasting flavor. The flavor chemicals and the solvents used in flavors must not only be approved for use in foods, but they must also not adversely react with the packaging material and the processing equipment with which they come into contact. Furthermore, they must meet the desired cost constraints. 1 Raw coffee beans are processed in two primary ways. 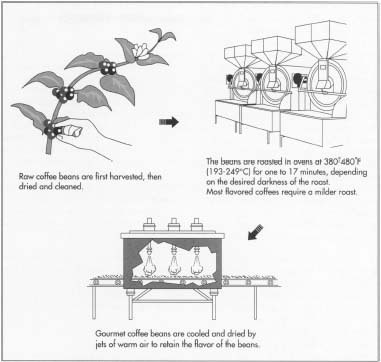 The "dry method" allows the beans to dry on the plant or be dehydrated by the sun after harvesting. The beans are then separated from the rest of the plant debris by milling. In the "wet method," the beans are steeped and fermented up to 24 hours, then a water spray removes the pulp, and the beans are dried in the sun or in tumble dryers. A hulling machine then removes the protective membrane around the bean. In both cases the beans are cleaned, sorted and graded. the heavier the flavor. There are five commons roasts: American, Viennese, Italian, French Dark, and Espresso Black. The American, or Regular, roast has light to medium brown beans, with no oil on the bean. It makes mild to medium coffee with a definite acidic snap. The Viennese roast is slightly darker than American roast. The Italian, also known as Continental, roast features dark brown beans with an oily surface. It makes coffee that is dark flavored and bittersweet. French Dark roasting produces dark brown, almost black beans, with a shiny, oily surface. With its smoky, roasty flavors, it makes an authoritative coffee. Espresso Black is the highest roasting degree. This roast produces beans which are almost carbonized, and it yields the strongest brew. If flavoring is added to beans which have too mild a roast, the coffee lacks significant flavor characteristics, and a flat-tasting beverage results. If the roast is too dark, the added flavor is overshadowed by the taste of the beans. For example, a French Vanilla flavor will be lost on a French Roast bean because the robust quality of the bean will overwhelm the sweet creamy tones of the flavor. The perfect roast color for flavored coffee is medium to brown. After the beans are roasted, they must be quickly cooled before flavorings can be added. Flavoring the beans while they are still at high temperatures can destroy some of the flavor compounds. In large commercial operations, cooling is done by water quenching, which is a quick, economical process that has the undesirable effect of leaching out some of the natural flavor of the beans. Gourmet beans are dried more carefully, usually by jets of warm air. averaging 2.7% industrywide. A 3% usage rate means that three pounds of flavor oil are added to 100 pounds of roasted beans. The amount of flavoring required depends primarily on the type of flavor and its intensity, as well as the type of bean used and its roast level. Cost constraints also may play a role in determining how much flavoring to apply to the beans, because flavors are relatively expensive. The combination of flavors to be used and the quantity to be applied to the beans is established by experimental trial and error, in which test batches of beans are flavored with small quantities of oil until the desired characteristics are obtained. This formulation process is similar to the way one decides how much sugar to put in a cup of coffee or tea—add a small amount, taste it and, if necessary, add a little more. Once the precise amount is set, the dosage is held constant for that particular flavor oil and roasted bean combination. For different combinations of oils and beans, the usage level must be readjusted for optimal results. 4 Flavors are typically added to roasted beans before they are ground. The beans are placed in a large mixer which is specially designed to gently tumble the beans without causing them damage. Examples of this type of mixer include ribbon blenders, drum rotators, and candy pan coaters. The flavors are usually introduced via a pressurized spray mechanism which breaks the oils into tiny droplets which allows for better mixing. Oils must be added to the beans very gradually to guard against areas of highly concentrated flavor called hot spots. The beans are agitated for a set amount of time to ensure the flavor is evenly spread. This process may take 15-30 minutes, depending on the batch size and mixing characteristics of the oil. When the beans are properly coated, they take on a glossy finish that indicates a uniform distribution of oils. It is also important to note that, instead of flavoring whole beans, flavors in dry form can be blended with ground coffee. In such cases, the flavors are encapsulated in starch or some other powdered matrix. There is enough moisture in the coffee to promote transfer of flavor and color from the encapsulated flavors to the coffee grounds in about 24 hours after mixing. 5 The finished product is packed in bags or cans as quickly as possible and sealed to prevent contact with the atmosphere. Prior to packaging the container is flushed with nitrogen (an inert gas), a process that removes oxygen from the container. Oxygen can react with components of the flavor oils and the beans and cause deterioration. Coffee beans, once roasted, release their oils and begin to stale quickly when exposed to oxygen. Briefly flushing the container with nitrogen before filling pushes all the oxygen out and ensures freshness. Flavored beans should be stored in a cool, dark place if they are to be used within three or four weeks. If longer storage is required, the beans may be frozen. The quality of flavored coffees is assessed at various points throughout the manufacturing process. Before roasting, beans which do not meet standards for color or size are removed. This helps ensure a more even distribution of beans. After roasting, the color of the beans (which indicates the degree of roast) can be standardized by visual comparisons or with an analytical device known as a colorimeter, which measures the color of the beans. Beans which are over- or under-roasted are rejected. Similarly, the quality of the flavor oil is carefully checked. Flavorists use various analytical techniques, such as gas chromatography or spectrophotometry, to check flavor quality. These techniques can identify flavor compounds by analyzing their molecular structure. Individual natural and synthetic components are analyzed, as are the finished blended flavors, to ensure the consumer will taste the same quality of flavor from batch to batch. The quality of the final flavored product is checked with a sensory evaluation technique known as "cupping." This method involves placing 2.5 ounces (7.25 g) of ground coffee in a cup and adding 3.4 ounces (100 ml) boiling water. Both aroma and flavor can be evaluated in this manner. To communicate differences in flavor, the industry uses about 50 specialized terms to describe subjective flavor qualitites, such as earthy, nutty, spicy, and turpeny. While there are no specific "coffee standards" the beans in particular must comply with, there are regulated Good Manufacturing Processes (GMPs) for food products. Relevant regulations are provided in the Code of Federal Regulations Title 21. Production of flavored coffee beans does produce some waste in the form of beans that are rejected for one reason or another. There may be some degree of waste of the flavoring compounds due to batching or weighing errors. There is also waste in the form of solvent evaporation, which occurs during the curing process. These waste materials are not typically considered to be harmful, and therefore there are no special waste disposal requirements. As advances in food technology are made, it is likely that improvements will be made in the manufacturing process for flavored coffee beans. Better mechanical methods of sorting and roasting beans will lead to more efficient production. More substantive heat resistant flavor compounds will be developed and, ideally, new technology will lead to flavors which cure onto the beans with no heat whatsoever. Of course, flavor chemists will continue to develop new exotic flavor compounds. It is also interesting to note other unconventional methods of flavoring coffees are gaining popularity. For example, instant flavored coffees have established a place in the mass market. These are made by entirely different processes, such as extracting the coffee flavor from the beans then spray drying, or by freeze-drying the coffee and blending it with flavor agents and other adjuncts. Also worthy of notice is an innovative new flavored coffee filter, which contains flavoring agents in the filter itself. It is touted as an economical way to serve flavored coffee and lets the consumer use his/her favorite coffee brand. Similar innovations will become common as the future of flavored coffees unfolds. Kuntz, Lynn, "Coffee and Tea Beverages." Food Product Design, July 1996, pp. 78-100. Mosciano, Gerard, et al. "Organoleptic Characteristics of Flavor Materials." Perfumer and Flavorist, November/December 1996, pp. 49-52. Beck Flavor Brochure, Beck Flavor Company, 1996.